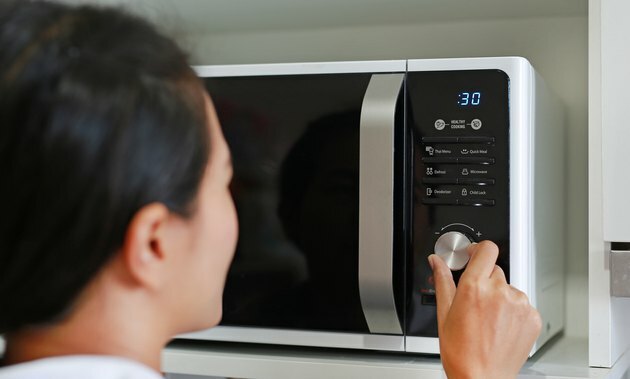 It's been taboo for so long it seems wrong, but a metal shelf in your microwave is actually a beneficial item in many ways. The rack perched well above the turning plate at the base of the microwave can double the capacity of your microwave. It also offers numerous cooking options you may have never thought of performing in the microwave. That gleaming metal rack in the center of some microwave models is tuned to the metal in the cavity of the oven itself. By using plastic or rubber clips to hold the metal to the sides of the oven, the rack is safe and no arcs of energy will flash in your microwave. That flash comes from the electrons banging into the metal's atoms. The racks are usually high enough that most of the things you use your microwave to cook or reheat can slide onto the main turning plate at the bottom of the microwave and not be bothered by the rack. This way, you don't have to store the rack or search for it when you need to use it. It can safely sit unused in your microwave and easily be removed on the occasions when you have rather tall or large items to cook in the oven. The rack doubles the cooking surface in your microwave. By having the rack in place, you can cook your breakfast burrito while reheating your morning coffee or tea. The wave flow that travels up and over and around the rack cooks food more evenly. This makes it better for defrosting and cooking foods, such as meat and fish, that need to be cooked thoroughly. Although you may have a metal rack sitting snugly in your microwave oven, don't take it as a sign you can put any old hunk of metal in it. This includes forks or other metal eating utensils, aluminum, a generic metal rack, small pots or pans and lids to cover food so it won't splatter. The rack that came with your oven has been tuned to that oven for safety reasons. The rack can never be placed on the bottom of the oven cavity. This will cause it to come into contact with the metal of the oven and make it reactive. It's the little rubber clips or plastic outcroppings that it sits on in the oven that make it safe to use in your microwave. What Is the Black Residue on My Aluminum Pans?